A meeting of the Daniel Boone Wilderness Trail Association was held at the Cove Ridge Center at noon on March 16, 2018. Present were Cory Gardner, Larry Fleenor, Glenn Gannaway, Joy and John Mullen, Jim Addington, Jim Stallard, Randy Rausch, Nancy Childress, Margaret Crouch, Bob McConnell, Gretchen Cope, Joan Short, and Grace Bradshaw. Joan called for a moment of silence to honor Wanda McConnell and Michael Rhoten. There being no further nominations from the floor, Jim Addington moved and John Mullen seconded that the slate of nominees be approved by acclamation. The motion carried. There being no further nominations from the floor, Grace moved and Larry Fleenor seconded that the slate be approved by acclamation. The motion carried. The minutes of the November 17, 2017 meeting were approved as read. Gretchen noted that she had received $600.00 in membership dues and that more had come in today. The treasurer’s report (attached) was approved as presented. Bob reported that the Interpretive Center was nearing completion in its construction. He also reported that they still did not have a contract for the building of the exhibits, but that they were nearing an agreement with Color-Ad, Inc. in Manassas, Virginia. He believes an opening in July is a feasible expectation. Park Report: Robert Chapman reported that the OSU volunteers had built 9 picnic tables, a blind for a dumpster, and other additions. He noted that the six girls on the team did quality work. He said they are in the process of opening up the campgrounds and getting in gear to open the pool area. Hiring for the summer season continues and some of those hired have begun training. President’s Report: Joan reported that weather-wise, DBWTA has had a tough year so far. Old Christmas and the Fall Festival had to be cancelled due to inclement weather. However, the cancellation of the Fall Festival may have worked out for the best since the crew of volunteers could concentrate on the filming of a short movie to introduce visitors at the new Interpretive Center to the Wilderness Trail experience. Joan thanked all who gave time to help at the Block House and Carter Cabin. She noted we still need more interpreters at the Block House and at Carter Cabin. She is hopeful that an AmeriCorps volunteer may be assigned to our park and may be able to hold the Block House open for one additional day a week. She also noted that we need to recruit more young members and volunteers. Argentine Film Company’s film: A rough cut of the film to be shown as an introduction to the Interpretive Center was viewed by the group. Joan noted that the cold, gloomy weather set a perfect mood for the hardships of going over the trail to Cumberland Gap. Tom Anderson, a descendant of John Anderson, builder of the Block House at the start of the Wilderness Trail, requested a book about the Block House from Gretchen. In return he sent copies of watercolor paintings and news articles about the fire that destroyed the original Block House. Also included were pictures of Maj. Isaac Anderson (son of John Anderson) and his wife Martha Rhea. Gretchen shared these items with the group. Frontier Muster and Trade Faire, April 27-29, 2018: Joan noted that we need a good auction this year as the money earned will be for our events account. She encouraged members to look for items to donate to the auction. Randy Rausch passed around a beautiful knife he has made for the auction. Peggy Rausch is loaning a set of canvas flags which will be used to number each event area. The events committee will meet Thursday, March 22nd at 7 p.m. at the Cove Ridge Center to discuss in more detail the planning of the muster and trade faire. Jim Stallard noted that the Sons of the American Revolution will have a Patriots and Pathfinders program, but that he has not yet heard whether the Watauga Fife and Drum Corps will be on hand. Bob McConnell told the group that articles of clothing, books, rifles and accoutrements from the estate of Michael Rhoten habe been given to DBWTA and to the Watauga group. Some will be preserved for the Interpretive Center, some have been sent to Watauga. Some will be auctioned at the Trade Faire. Jim Stallard also noted that a former member, Joe Culbertson passed away last week. Joe was the one who made the broad axe on display at the Block House Visitor Center. Joan noted that Chad will lead the Sunday morning worship service and will provide time to honor and memorialize friends of DBWTA who have passed away. There being no new or old business to attend, the meeting was adjourned. A meeting of the Daniel Boone Wilderness Trail Association was held at noon on November 17, 2017, at the Cove Ridge Center. Present were Kay and Jim Addington, Keith Wilson, Randy and Peggy Rauschenberg, Rachel Blevins, Joe Fuller, Larry Fleenor, Pam Cox, Nancy Childers, Gretchen Cope, John and Joy Mullen, Ron and Joan Short, Grace Bradshaw, and Scott Bowen. Introduction of Visitors: Joan introduced new staff member Rachel Blevins. She welcomed visitors Keith Wilson, Peggy Rausch, and Kay Addington. Minutes: The Minutes of the September DBWTA Meeting were reviewed. John Mullen moved and Randy Rausch seconded that the minutes be accepted as written. The motion was approved. Treasurer’s Report: Gretchen. One offered a written Treasurer’s Report for the perusal of all members. She pointed out that a new breakdown of expenditures from the events account was approved at the last DBWTA Board Meeting. The new method will help track expenditures in each category. Joan pointed out that Gretchen is managing the website now, but despite attempts to change status, we are still paying for web site management. Keith Wilson said he would help rectify the problem. Pam moved and Joy seconded that the Treasurer’s Report be accepted as written. The motion carried. Report from Partners on the Trail: Scott Bowen reported that they had a very busy October with 1200 attending their Heritage Festival and 2000 attending their Halloween event. They are planning their Christmas Fest and expect to have 40 trees decorated by community groups. On December 8 they will ha e 700 fourth and fifth graders who will tour the trees of Christmas Fest and the mansion, and enjoy storytelling. The event will be broadcast digitally on YouTube. Scott also reported that he and Joan attended a Friends of Boone Trace at Berea led by Dr. John Fox and that Joan gave an excellent presentation on what we are doing at the beginning of the Wilderness Trail. Since Robert Chapman was interviewing candidates for chief ranger, Gretchen made a report on Natural Tunnel State Park. The park staff are in the process of setting up all the lights for Christmas season and the Lighting of the Tunnel events which begin the Friday after Thanksgiving and continue through Christmas, with the last week filled with theme nights, including Santa vs. Darth Vader. Second Grade classes at Duffield Elementary are making Christmas ornaments for the tree and will come to an open house and the lighting of the tunnel. Program: Joan offered a description of the two days of filming for the new Interpretive Center and the stalwart re-enactors who braved rain and snow and the chilly waters of the Clinch during two long days of filming. The rain was so fierce on Saturday that the Harvest Festival had to be called off. Joan thanked Ron who started and kept six fires burning even in the rain. Dale Taylor and Joe Brown still managed to stir salt. Randy Rausch was at the forge. Joe welcomed people to the Blockhouse. The Smith Family, Gretchen and Abby Mae, Cory Gardner, and horseman Charlie Green and his horse Stormy all did their part. The two warriors of Anikituhwa did a great job. Bill Caywood drove the van and kept it warm for the wet and cold actors who finished their filming at Martin Station on Sunday. Joan also expressed appreciation to Scott Bowen for his support and that of the folks at Cumberland Gap. She praised Nancy Childers for providing lunch for the whole crew. 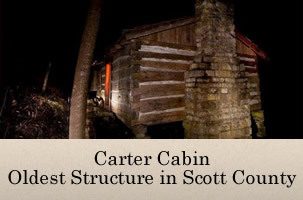 Carter Cabin: During Christmas season many volunteers are needed for the Carter Cabin. They can either be greeters who help keep the outdoor and indoor fires burning, or they can wear re-enactor garb and tell the story of the Carter Cabin whose walls were part of Carter’s Fort at Rye Cove. Volunteers serve from 6 p.m. to 9 p.m. at the cabin. Dale Taylor is keeping the schedule. Joan mentioned that she is trying to build a wardrobe for re-enactors; to that end the DBWTA Board authorized her to order three sets of men’s leggings that are period correct for the Daniel Boone era. Old Business: Ron reminded the group that Music along the Wilderness Trail makes a great stocking stuffer and is on sale at the Visitor Center. There being no new business, Pam moved to adjourn and the motion was approved. A meeting of the Daniel Boone Wilderness Trail Association was held at the Cove Ridge Center at noon on Friday, September 15, 2017. Present were Robert Chapman, Nancy Childers, Jim Stallard, Larry Fleenor, Margaret Crouch, Wanda and Bob McConnell, Joan and Ron Short, Gretchen Cope, Joe Fuller, John and Joy Mullen, Jim Addington, Scott Bowen, and Grace Bradshaw. Approval of Minutes: The minutes of the July 21, 2017 meeting were approved as read. Treasurer’s Report: Gretchen shared the treasurer’s report for July and August. Joe Fuller moved and John Mullen seconded that the treasurer’s report be approved as presented. It was approved unanimously. Report from Partners along the Trail: Scott Bowen reported that construction is proceeding on the Native American Village at Wilderness Road State Park. They anticipate completion in October of 2018. The third week of each month they are inviting volunteer labor to participate in the construction. He also reported on an Immersion Weekend the park held where 6 people paid $300 to dress in period clothing, eat period food, and camp out as though they were on the Wilderness Trail in the 18th century. Their Ghost Tours and Haunted Dinners are already sold out. Their Heritage Festival is October 14. They will have 45 vendors and entertainment. Pumpkins in the Park is an event scheduled for October 27-28 and they are expecting 3500-4000 participants. Robert Chapmen reported on the activities of Natural Tunnel State Park as they are closing down the pool area and winterizing facilities. They are working on hiring new office staff for Cove Ridge and are seeking new hires for the chair lift. They have interviewed people to fill the post left vacant by Megan Krager and have recommended an applicant for approval in Richmond. Lighting of the Tunnel is scheduled for the weekends from November 24 and all week beginning on December 18. The evenings of the last week will be themed: Christmas Karaoke, Decorated Cookie, Craft Night, Ugly Sweater Night, and Santa vs. Darth Vader. Joan will discuss with Robert some maintenance issues that need to be addressed at the Carter Cabin and the lighting that needs replacement along the route to the Cabin. Robert also reported that park staff will go to Florida to help reopen the state parks there that had much damage from Hurricane Irma. Report on the new Interpretive Center: Bob McConnell reported that the construction of the Interpretive Center is on schedule. The filming for the displays at the center has been scheduled for October 26, 27, and 28. A storyboard for the filming will be organized at the next Events Meeting which will take place on September 26, 2017, at 6:30 p.m. at the Visitor Center of the Block House. Some of the filming will take place at the Harvest Festival on October 28. Preparation work will begin at 10 a.m. on the 28th and the Festival will be open from 1-5 p.m. For the filming sequences, a core group of 3-7 re-enactors is needed. Plenty of extras are needed, too. Costumes will be juried and should be period correct in all ways. President’s Report: Volunteers are needed for the Harvest Festival on October 28, for the Block House, and for the Carter Cabin. Joan invited members to come along to the Block House and the Cabin to observe and learn what is entailed in being an interpreter at both places. She also offered the materials that she has assembled for being an interpreter to anyone who wants to volunteer. In addition, she invited anyone who is interested to join in the Events Meeting on September 16th at the Visitor Center of the Block House to help plan the Harvest Festival and the filming sequences for the Interpretive Center. Program: Scott Bowen shared the Bizarre Foods episode featuring the Wilderness Road State Park. The cooks at Martin’s Station shared such delicacies as pickled ramps and buffalo tongue, elk tenderloin, and corn fritters. Scott said that 71 visitors have come to the park just because of seeing the Bizarre Foods episode on television. The national exposure to the Wilderness Trail has been great. There being no further business, the meeting was adjourned at 1:08 p.m.
A meeting of the Daniel Boone Wilderness Trail Association was held at the Cove Ridge Center on Friday, July 21, 2017. Present at the meeting were Margaret Crouch, Jim Addington, Bob McConnell, Wanda McConnell, Sally Kelly, Joe Fuller, Jean Hood, Edgar Hood, Scott Bowen, Bill Cawood, Joan Short, Ron Short, Jim Stallard, Joe Brown, Corey Gardner, Megan Krager, and Gretchen Cope. Joan Short welcomed and introduced the guests. The minutes of the May 19, 2017 meeting were approved. Gretchen Cope delivered the treasurer’s report. A copy is on file in the secretary’s archives. Jim Addington moved that the report be approved. Ron Short seconded the motion and it was approved unanimously. Scott Bowen reported that Wilderness Road State Park was busy and that everything was going well. Scott announced that the park would be featured on Bizarre Foods with Anthony Zimmern at 10pm on August 1. He added that they would try to have a community showing at the Lee Theater sometime after it airs. Scott also reported that fundraising for the Native Camp had gone well and that they were looking at beginning construction in April 2018. Gretchen Cope reported that the pool had been very busy and that there were after-hours pool parties scheduled for almost every day that we didn’t have swimming lessons. She also stated that the campground had been booked to capacity several times throughout the summer and that cabin and yurt rentals were going very well. The Cove Ridge Center and lodges had been busy with weddings, family reunions, workshops, camps, and all sorts of different activities. Gretchen added that the children who participated in the Nature Trek 360 camp were able to visit the Blockhouse during the two-night/three-day camp and play period appropriate games, start a fire with flint and steel, and make pizzas in the bake oven. Bob McConnell reported that they need camp items, such as a tripod, and period correct clothing to be used for a clothing trunk. He explained that the clothes really needed to be worn, tattered, and well-used for the sake of authenticity. Bob also explained that a date for filming would be set soon and he would notify those who wanted to participate. Joan Boyd Short expressed her concerns regarding the lack of volunteers to help host the Blockhouse. She explained that so many were unable to help, for very legitimate reasons, which made it hard to keep it open. Ron Short utilized the grant money that was received for Native American education to hold an art show at the library in Wise, VA. The show featured Native American and Appalachian art. Bob McConnell moved to adjourn. Sally Kelly seconded the motion and it was approved unanimously. A meeting of the Daniel Boone Wilderness trail Association was held at the Cove Ridge Center on Friday, May 19, 2017. Present at the meeting were Joan Short, Dale Taylor, Gretchen Cope, Grace Bradshaw, Larry Fleenor, Jean Hood, Edgar Hood, Leighton Harding, Margaret Crouch, Mary Ruth Lassiter, Eunice Lassiter, Joe Fuller, Ron Short, Cory Gardner, Ryan Teague, Rubal Taylor, Randy Rauch, Robert Chapman, John Mullen, and Joy Mullen, as well as guests, the Warriors of Anikituhwa. The minutes of the March 17, 2017 meeting were approved as read. Joe Fuller reported monies received in the Operation Account as $2,021.17 for the April 1 through May 15 period. This included $1,697 earned at the Muster Auction. He reported expenditures of $1,252.04 for the period and an ending balance for $18,704.63 in the Operations Account. The Contingency Account remained virtually the same, ending at $13,902,80. The Grants Account had an ending balance of $4,521.23. Jean Hood moved to approve the treasurer’s report. Jim Stallard seconded the motion and it was approved unanimously. wisdom and cultural practices from their elders. He referred to the mountain Cherokee territory in North Carolina near Bryson City as the Quallah Boundary, and explained that “Anikituhwa” means “I come from the Mother Town.” Their home place is in the center of a great bowl of mountains. He explained that their tattoos were marks earned and conferred upon them by their elders for works they have done for their people. He also explained that they consider themselves modern day warriors, fighting for the preservation of their culture. Micah Swimmer explained how he was teaching Cherokee language to both the very young and to their parents, so that they may become fluent in their native language. They will perform Saturday, May 10th at 7 p.m. in the amphitheater. Joan reported that the Warrior’s Program had been presented to Rye Cove Middle School, Rye Cove High School, and Duffield Elementary School students. She invited all members to attend on Saturday night and to wear their DBWTA shirts to identify themselves and to be helpful as ushers. She reported that she and Gretchen would be demonstrating flax breaking and spinning at Sycamore Shoals on Saturday. She praised the group for their participation in the Muster and reported the $1,697 earned at the auction. She also expressed a need for volunteers at the block house and asked members to consider which weekends they would be available to help out. Robert Chapman reported that as of May 16th the new cabins were open and were all rented for the weekend. The yurts are also now open. Staff training has been proceeding apace. They have hired 60-65 new staff for the summer. The pool opens May 20th. Ryan Teague reported that the Raid at Martin’s Station was a success with 3,000 visitors and 400 re-enactors. He also reported that Bizarre Foods filmed at Wilderness Road and that Bonnie did some cooking on the program. He said they have many nature programs planned and that they have opened a new Fishing Trail along Indian Creek. They raffled five period reproductions to earn more money to fund the Indian Village which is still in development. Joan reminded him that DBWTA has $1,000 set aside for the Indian Village which they can request when they have a need for it. There being no further business, Ron Short moved and Jean Hood seconded that the meeting be adjourned at 1:30 p.m. The motion carried. A meeting of the Daniel Boone Wilderness trail Association was held at the Cover Ridge Center on Friday, March 17, 2017. Present at the meeting were Barbara Reed, Benny Reed, Wanda McConnell, Bob McConnell, Dale Taylor, Jim Stallard, Kaden Kilgore, John Mullen, Joy Mullen, Grace Bradshaw, Joan Short, Ron Short, Melinda Scott, Robert Chapman, and Nancy Childers. It was moved and seconded that nominations be closed and the slate accepted by acclamation. The motion carried unanimously. It was moved and seconded that nominations be closed and the slate of directors be accepted by acclamation. The motion carried unanimously. The officers having been approved, Joan Short, newly elected president, took up the agenda, first with the approval of the minutes from the January 27, 2017 meeting. Dale Taylor moved that the minutes be approved, Ron Short seconded, and the minutes were approved unanimously. There was no Treasurer’s Report as both Gretchen and Joe Fuller were unable to attend the meeting. Joan assured members that they were working closely together so that Gretchen can transition into the job of treasurer. Kaden Kilgore distributed fliers for the Frontier Muster and Trade Faire to be held at Natural Tunnel on Saturday, April 29 from 10 a.m. to 5 p.m. and on Sunday, April 30 from 11 a.m. to 3 p.m. He also reported on improvements being made in the park: with the recent help of college volunteers from University of Maine, three yurts have been completed, signs have been posted on the birding trail, picnic tables have been installed, and brush has been cleared. This week volunteers from Ohio State have been working on the Spring House at the Block House, have constructed new picnic tables, and have worked on a reservation sign. Joan encouraged members to check the web sites for Wilderness Road State Park and Sycamore Shoals so they can be sure to participate in historical events coming up the second and third weekends in May. The new Interpretive Center is going up and a board retreat is planned for the near future to build membership and plan ways to solicit donations. A review of the past year’s activities showed that more events were occurring in close proximity. The Fall Festival was a success. The Christmas Lighting of the Tunnel weekends had volunteers participating at the Carter Cabin throughout the Christmas season. Several participated in the Wilderness Road “Women in the Wilderness” two-day event. As for the Frontier Muster coming up on April 29-30, Joan says that Jackie Fisher will be on hand to do Indian Cooking, Charlie Brown will demonstrate how to tan hides, Bonnie Banks will help cook, and there will be salt boiling, along with the usual demonstrations. She encouraged members to think about donating items for auction, as the auction yielded over $1000 last year. Items to consider are period clothing, pottery, baskets, chairs, shawls, knitting, hatchets, knives, and so on. On June 15th, Mountains of Music will have a concert at the Park. The Blockhouse will be open all day that day. July 15th will be Railroad Day at the park, and the Carter Cabin and Blockhouse will both be open. A schedule will be developed for volunteers at the Blockhouse and the Carter Cabin and reminders will be sent out at the beginning of the week. The Travel Channel’s show Bizarre Foods may be interested in visiting the Park the week of April 23rd. A slide show of the new Interpretive Center showed what it would look like inside and out, with a log cabin exterior and an interior with exposed beams. It also showed the magnificent view of Cane Gap that can be appreciated from the viewing platform and the walkway. Bob McConnell pointed out on the blueprints where the entrance, the theater, the gift shop, the library, the classroom, the multi-purpose room, and the exhibit area would be. He explained the flow of the exhibits and the interactive opportunities for visitors. He also told us that William Anderson has offered his collection of research materials on the Blockhouse and the Wilderness Road to be housed in the library at the Interpretive Center. Joan also mentioned that Eric Phillips, a Scott County teacher, is completing an annotated bibliography of both fiction and non-fiction works pertaining to the Wilderness Road. No old business was brought forward. Bob McConnell suggested a fundraiser in the form of a raffle, where the association would buy a powder horn from Randy Rauch, for example, or a bag from Charlie Allen, and raffle it off, maybe announcing the winner at the end of the auction at the Frontier Muster. Nancy Childers suggested raffling a quilt as well. Bob’s rationale for the fundraiser was to earn money to buy period correct, clothing, weaponry, and accoutrements for the three or four mannequins they will have on exhibit. He wanted to avoid soliciting donations in kind for fear the donations would not be authentic to the period. The exhibits will also require high resolution photographs. He asked members to see if any community business or organizations would like to donate the money to complete an exhibit. There being no further business, the meeting was adjourned at 1:17 p.m. The meeting of the Daniel Boone Wilderness Trail Association was held at the Cove Ridge Center on Friday, November 18 at 12 pm. Present at the meeting were Larry Bishop, Scott Bowen, Grace Bradshaw, Joe Brown, Robert Chapman, Gretchen Cope, Madison Edwards, Pam Eddy, Buford Ervin, Nick Fitzimmons, Larry Fleenor, Joe Fuller, Leton Harding, Megan Krager, Bob McConnell, Wanda McConnell, John Mullen, Joy Mullen, Randell Rauch, Barbara Reed, Benny Reed, Joan Short, Ron Short, Dale Taylor, Ruble Taylor, Mary Trigiani, and Gary Williams. Pam Eddy introduced Nick Fitzimmons, who was currently serving as an intern at Cumberland Gap National Historical Park. Buford Ervin and Adriana Trigiani from Powell Valley National Bank were also introduced. Bob McConnell moved that the minutes be approved as written. John Mullen seconded the motion and it was approved unanimously. Joe Fuller delivered the treasurer’s report. A copy of the report is kept on file in the secretary’s archives. Benny Reed moved that the financials be approved. Barbara Reed seconded the motion and it was approved unanimously. Ron Short reported that a check for $4,800, a grant to be used for educational programs, was in the mail and should be arriving at any time. Bob reported that the site preparation was underway and that construction should begin after completion. He added that the expected time for construction was right at one year. Bob added that there was an opportunity for those that would like to donate exhibit items or money to purchase exhibit items. Pam Eddy reported that Cumberland Gap National Park was offering a series of workshops and similar programs that focus on what it’s like to be a park ranger. Scott Bowen reported that the parks visitation was up and that they had a lot of upcoming programs and special events. Bob McConnell moved to adjourn the meeting. John Mullen seconded the motion and it was approved unanimously. The meeting of the Daniel Boone Wilderness Trail Association was held at the Cove Ridge Center on Friday, November 18 at 12 pm. Present at the meeting were Charlie Allen, Scott Bowen, Robert Chapman, Gretchen Cope, Pam Cox, Margaret Crouch, Aaron Davis, John Fox, Joe Fuller, Leon Gamble, Megan Krager, Jim Mallory, Bob McConnell, Wanda McConnell, John Mullen, Joy Mullen, Barbara Reed, Benny Reed, Randy Rauch, Joan Short, Ron Short, and Eddie Woodward. Joan introduced Jim Mallory with the Lewis and Clark Trust, Inc. and Dr. John Fox with the Friends of Boone Trace, who provided a program for the meeting. She also introduced Randy Rauch, who would be providing a program for the January meeting. Bob reported that the low base bid and bid additives were both under budget, civil rights review was completed and passed, and proposals were sent to VDOT. The process was taking longer than expected, but Bob did anticipate that the project would finally come to fruition. Joan reminded the Association that volunteers were needed to host the Carter Cabin for the Natural Tunnel Christmas Lighting of the Tunnel events on Friday and Saturday nights. She had a sign-up sheet available. James L. Mallory, Lewis and Clark Trust, Inc.
Ron Short moved to adjourn the meeting. Margaret Crouch seconded the motion and it was approved unanimously. The meeting of the Daniel Boone Wilderness Trail Association was held at the Cove Ridge Center on Friday, September 16 at 12 pm. Present at the meeting were Jim Addington, Charlie Allen, Scott Bowen, Grace Bradshaw, Joe Brown, Robert Chapman, Gretchen Cope, Buford Ervin, Jacqueline Fischer, Joe Fuller, Charlie Greene, Megan Krager, Bob McConnell, Wanda McConnell, John Mullen, Joy Mullen, Jim Stallard, Dale Taylor, and Ruble Taylor. Vice President of the Daniel Boone Wilderness Trail Association Dale Taylor opened the meeting in the absence of President Joan Boyd Short. Dale welcomed everyone and introduced Buford Ervin with Powell Valley National Bank, a guest of Charlie Allen’s. He also introduced Jacqueline Fischer, a historical interpreter from Wilderness Road State Park who was to provide a program during the meeting. Bob McConnell moved that the minutes be approved as written. Charlie Allen seconded the motion and it was approved unanimously. Wanda McConnell moved that the financials be approved. John Mullen seconded the motion and it was approved unanimously. Robert Chapman reported that the new cabins should be online sometime in early 2017. He had been in contact with Tempurpedic about mattresses for the cabins. Robert also announced that yurt construction was underway. Scott Bowen reported that their ghost tour programs were very popular and were already full. He announced that Pumpkins in the Park would be October 27-29. Their women on the Frontier program brought in approximately 350 visitors. Bob McConnell reported that bids were due October 5th. Jacqueline delivered a wonderful presentation that was very well received by all who attended. Her time and efforts are much appreciated. Dale reminded those in attendance that the Harvest Festival would be held on October 22 from 1-5. Bob moved to adjourn the meeting. Joe Fuller seconded the motion and it was approved unanimously. The meeting of the Daniel Boone Wilderness Trail Association was held at the Cove Ridge Center on Friday, July 15 at 12 pm. Present at the meeting were Jim Addington, Bill Cawood, Robert Chapman, Gretchen Cope, Margaret Crouch, Larry Fleenor, Grant Hardin, Megan Krager, Bob McConnell, Wanda McConnell, Joan Short, Ron Short, Dale Taylor, Edward Wemytewa, and Gary Williams. President of the Daniel Boone Wilderness Trail Association Joan Boyd Short opened the meeting and welcomed everyone in attendance. Joan then introduced guests Edward Wemytewa, long-time friend of hers and Ron’s, and Gary Williams, a friend of Dale Taylor’s. Bob McConnell moved that the minutes be approved as written. Ron Short seconded the motion and it was approved unanimously. In Joe Fuller’s absence, Gretchen Cope delivered the treasurer’s report. A copy of the report is kept on file in the secretary’s archives. Dale Taylor moved that the financials be approved. Wanda McConnell seconded the motion and it was approved unanimously. Robert Chapman reported that he hoped to have the Park Office Manager position filled by the first weekend in August. He also said that the four new cabins should be open by November and that construction on the yurts would hopefully start sometime in the fall. Bill Cawood reported that during the Virginia Is for Students Tour, a week-long Cove Ridge Foundation sponsored trip for high school students, they had the opportunity to stop at the Frontier Culture Museum. He explained that it was a wonderful trip and described the activities and programs they had participated in. Megan Krager reported that she and the other interpretive staff had been very busy with groups and programming. Joan announced that a report from Wilderness Road State Park’s Manager, Scott Bowen, had been distributed along with the minutes. Joan explained that Chris, an employee at Wilderness Road, had offered to build some two-piece camp tables for the Association. Joan stated that she had not yet heard back from him about the cost, but she would relay that information once she did. Bob McConnell reported that VDOT had the engineering package and they were just waiting to hear back from them. Joan explained that the Association is in desperate need of volunteers to help with programming and events. There are still several vacancies for the Blockhouse and Carter Cabin dates and help is always needed for the larger events like the Harvest Festival. She also explained that the Association needed to put together guidelines and specific information on the Blockhouse and Carter Cabin. A packet like this would be helpful to volunteers. Ron Short reported that he had been pursuing grant opportunities to assist with the funding for existing DBWTA programs as well as community programs. There was also a lot of discussion about the film for the new Interpretive Center. Bob moved to adjourn the meeting. Ron seconded the motion and it was approved unanimously.